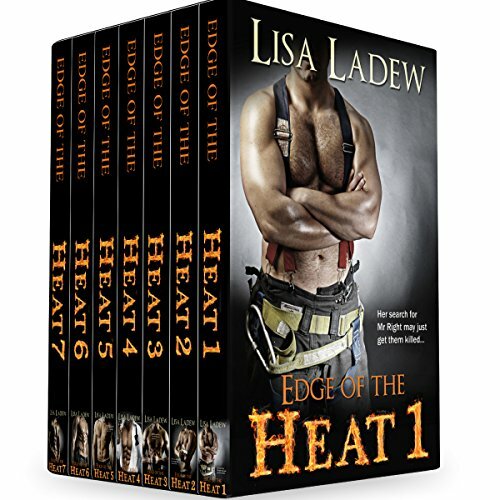 Showing results by author "Lisa Ladew"
This audiobook bundle contains the fifth, sixth, seventh, and eighth stories in the One True Mate series. Hear the stories of Mac, Bruin, Harlan, and Jaggar as they search for their true mates. CANT WAIT FOR BOOK 5!!!!! Emma finally has her big family, and she and Craig are dealing with the complexities of being new parents, while Hawk and Vivian have become parents of twins, again. When Hawk's personality suddenly changes, Vivian has a mystery to unravel that she will need everyone's help with, or risk losing her husband and the father of her children forever. Dani and JT, thrilled to be entering a new phase of their life, struggle with something nobody should have to deal with, but that veterans often do, leaving them unable to help Vivian. Bruin has never fit in with his kind because the bears hate him for something he can't control. The wolves like him OK, but now that his wolf BFF is mated, Bruin prepares for more lonely days and nights...until he meets a female so "purrfect", the sight of her breaks him. But is she already taken by another? Willow turned 25 this year and waits patiently for an angel to come and claim her, based on her mother's scattered recollection of the experience of Willow's conception. Jaggar is a half-wolf, half-mountain lion shifter, but his halves don't make a whole. Instead, they form the beast, a misshapen killing machine that terrifies even the hard-charging wolf shifters of the KSRT, especially after the mauling. Riot Cofield is a bad-boy mountain lion shifter who scales mountains like fences. He belongs IN the Natahala Forest but not TO it, and he resents “the Cause” because it turns normal, sweet women into conniving, savage witches - switches - who will do anything to kill a vampire. Riot tried out the Cause (after all, he is a shifter), but after getting used and discarded twice, he’s over it. Over and done with the Cause and everything in it, including Resperanza, the extraordinary, not-there-a-month-ago, magical house and command center. So he moved out, and oh yeah, he quit the Cause, too. Flint Gibson is ready to lay down his life for The Cause, just so long as doing so results in a ton of dead vampires. He’s been planning a kamikaze mission for decades, not-so-patiently waiting for news about the vampires who killed his family. Goldie Peletier has always been a good girl, prim and proper. But she has a secret, one she hides deep in the darkest corners of her soul and has never told anyone. If Flint and Goldie manage to join hearts, the strength they add to The Cause could make them an unstoppable team. But things have never worked out “just right” for our Goldie. Harlan Mundelein, the Knotted Wolf, the soldier at heart who used to be the guy who got things done, is fading. It's been a long and pointless battle, and he can finally see the day coming that he'll be eternally reunited with his Eventine. He's ready and his mind is made up: he is not getting a One True Mate. His mate is gone. So why does Leilani, a female who has mysteriously appeared to him twice in his lifetime, stir his blood in a way that makes no sense at all...especially when he knows she is not his mate? Beckett Oswego has lost himself in his work for years, always looking over his shoulder for the killer who stole his father and brother from him. When he isn't working, he parties his weekends away. Work, party...party, work. Anything to keep his mind busy and off the constant pain from the past that haunts him. Cerise Pekin has been captive for years, forced into a life of old ways and restrictions. Always planning her escape, she yearns for the day she can truly be free. Crew is a powerful, yet tortured, wolf shifter. With a weary heart, he seeks to avoid fulfilling a prophecy that foretells the death of his fated mate...true love lost before it has a chance to begin. Dahlia has seen her death at the hands of a demon many times, and the vision is starting to destroy her mind. Giving up on her sanity, her only hope is that death will come well and swift. But when she meets Crew, that all changes. Following a near death experience, Emma Hill's world is turned upside down. Haunted by a vision of the man who could very well be her soulmate, Emma is desperate to find that man, but fear stands in her way. Craig Masterson, the firefighter who saved Emma's life, finds himself falling for her. When he learns who her ex-husband is, he realizes that this is a battle he may not win. Choosing to love her is a deadly game. If he can stay alive, their love may flourish, but only if he can defeat her ex. Emma can run, but she can't hide. Her home bugged. Her ex-husband taunting her and still reeling from a vile attack that only her megalomaniac husband could be behind, Emma discovers that the man she's grown to love is missing. Finding him will require more courage than she believes she can muster, but cowering will guarantee that she will lose him forever. Jerry Mansko, a fun-loving Paramedic/Firefighter is in physical therapy for a major injury to his leg. His therapist, Sara Acosta, fascinates him from the first time he sees her. But there's something unavailable and even a little dark about Sara. When she walks out on a date with him he checks her apartment to ensure she's OK. But Sara's not there...and the words written on the walls in blood indicate a mystery far beyond his abilities to solve. Can Jerry find Sara and convince her to let him in to her life?